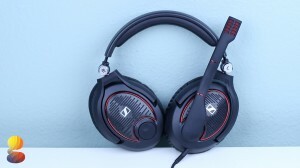 The G4ME Zero Black Headset is one of Sennheiser’s latest additions to its gaming lineup of products but it comes in at a steep price at about 279 dollars, so it’s made for those that have the extra money to shell out and that are really interested in stepping up their game. The first thing you’ll notice is the enticing black and and red color scheme. It’s not as flashy as the white version of the G4ME Zero, but many, including myself, appreciate the professional look. 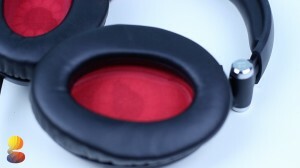 Build wise, the headset does have its fair share of plastic but it’s also made out of some higher end materials, with the ear cups and headband being laced with a soft leather. One thing I can’t emphasize enough is how comfortable this headset really is. The ear cups are extra wide, padded, and somewhat like memory foam, so they’ll fit to your head no matter how awkwardly shaped it is. Another thing I appreciate is that Sennheiser was able to get the perfect blend of adjustment with the headband. It doesn’t squeeze onto your head to much, but at the same time it isn’t too loose. So to sum up the build quality and hardware, the G4ME Zero has seriously nailed it. The headset is also extremely portable. It can be adjusted in a multitude of different positions and lays nice and flat in the provided carrying case. Speaking of the included case, it’s actually really nice. It has a tough outer shell that does a solid job of keeping the G4ME Zero protected so there’s no need to worry if you do a lot of traveling. On the left side of the headset you’ll find a non removable mic which actually does a solid job eliminating background noise amd its flexible end is a really nice touch as it prevents it from potentially being snapped. Towards the right side of the G4ME zero you’ll find a convenient spinning dial which is perfect for quickly adjusting the game volume. It’s something I really enjoy and wish other headset manufacturers worked. 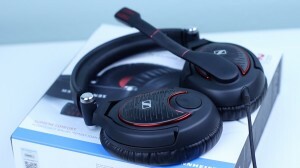 When it comes to the sound and audio quality for gaming, Sennheisser has really done a great job. I was able to make out footsteps and distant gun shots far better with this headset than other cheaper alternatives. While we wouldn’t expect anything less than stellar gaming audio from a headset priced this high, it did leave a little to be desired when it came to listening to music. While most headsets are bass heavy and drown out the mids, it was a bit of the opposite with this one. 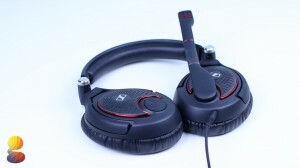 Like most other gaming headphones, they just didn’t perform as well for listening to music, but that is to be expected. But finishing up on a positive note, the G4ME zero delivers a fantastic user experience. 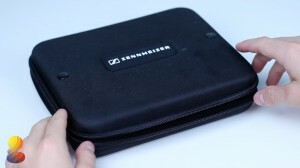 It’s extremely comfortable, has a solid mic, is ultra portable, and delivers some fantastic gaming audio. Anyone in the market for a high end headset that’s sure to up their gaming performance should definitely check out the G4ME Zero from Sennheiser. It’s available in both a white model and also the black one I have here. Links to the product will be down below!